It was a beautiful day, a scenic ground and a reasonable pitch for the Whalers final game of the season against new opposition, Palm Tree CC. That’s the positives done. Jack won the toss and elected to bowl, and for a while things were going ok, Nick, fired up and bowling to his mate Pat in the opposition got his man bowled, but not before Pat had hit a couple of cracking drives. Rakesh opening from the other end also chipped in with an early wicket. From there the droppsies kicked in, no fewer than 8 dropped catches and a missed stumping and against a good batting line up this would prove disastrous. At drinks things were fairly evenly balanced at 3 down for 70 odd but after drinks things unravelled. The slower bowlers struggled and the oppo moved the scoring rate up several gears, wickets did continue to fall, Dean, Geoff, Josh and Matt all holding on to good catches, Matt’s a particularly good effort diving forwards near the boundary, but runs were being leaked at an alarming rate and amongst the catches were the many drops and numerous incidents of poor fielding. Injuries were also mounting up, Rakesh struggling with a quad injury and Nick dislocating a finger. Palm Tree finished with 239 off 35 overs, too many. Resuming after Tea things immediately got worse, Dean went LBW to the spinner in the second over and Will followed shortly after. Kamal promoted to 3 was showing some grit but was undone by a straight one. Matt joined Geoff and they tried to rebuild, Geoff lofted a straight four and Matt nicely carved a couple of boundaries through point but that was as good as it got, Geoff hit one too many off the toe of the bat finally causing it to cave in and then didn’t need the replacement, missing a straight one, departing for a top score of 21. wickets continued to tumble, including a couple of run outs and mercifully the end came quickly. Whalers all out for 70 = big loss. This entry was posted in Uncategorized on September 11, 2018 by whalers1. And so a game which we thought was on Saturday and we had 5 players for remarkably turned into a gloriously sunny Sunday game with a full complement of 11. Featuring Whalers dayboos for Simon, Tilley and Rakesh, Dean took the captaincy reins on a pitch that looked hard and patchy and turned out to be very slow, promptly lost the toss and we were batting. Dean and Al opened up, the early surprise of the day was the dismissal of Dean in the opening over bowled by Julian for just 2 playing the wrong line sending his season average plummeting to the mid-eighties. Newcomer Simon joined Al and decided to only score in 2s. The pair added 43 but just as we was looking settled Simon played on for 12 also off the bowling of Julian. There followed a mid-order collapse as Roland departed lbw for 1, the returning James Gould bowled for the same score and Tilley for a duck 61-5 in the 16th over wasn’t looking pretty. It looked a stiff ask, more so when Amit dismissed Hale for a duck with the worst ball of his opening over. The Whalers kept the pressure on with some excellent fielding and the next two wickets fell to Kamal both caught by Al at mid-off leaving Believers 30-3 in the 12th over. Thereafter the scoreboard symmetry continued as Rakesh picked up a couple of wickets both caught by Dean at short cover. With Dean shuffling the bowlers Geoff picked up a couple of wickets, and there was a debut wicket for Tilley caught reluctantly and silently by James. With Simon getting in the action with a catch off James’ bowling the game looked done at 84-9. Overall a great team performance with contributions from everyone when required. Geoff’s match winning wicket won champagne moment. The other awards were keenly contested with Tilley’s casting vote crucial with Geoff’s all round performance edging Al out for MOM. Amit’s dancing around a ball leading to a 4 took home the muppet gong ahead of Dean, and James effortlessly earned fine of the day. This entry was posted in Uncategorized on September 4, 2018 by whalers1. After last week’s loss away at Energy Exiles, the Whalers returned to their familiar King’s House setting and to form with a comprehensive 8 wicket win over first time opponents Millwall Stars. The temperature was at bearable levels and it was also good to see some green grass on the outfield, something that had been missing for a good few weeks. Captain for the day (and most of the season) Will lost the toss and the oppo unsurprisingly decided to bat although with the overhead conditions potentially favouring the seam bowlers there were certainly worse tosses to lose. The Whalers lined up as follows: Dean, Luke, Channa, Will, Geoff, Nishan, Chris (debut), Josh, Dan, Russell, Kamal. Dan and Russell were the opening bowlers for the Whalers. Dan struggled a bit with his line and whilst not many runs were being scored off the bat, the wides were beginning to add up. Russell was having more success up the other end as he bowled tight to an attacking field. He produced the first wicket of the game as their opening bat flicked the ball into the air and succumbed to a diving Geoff at short midwicket. The second wicket soon followed- poor running between the wickets was to become a theme for Millwall (not helped in part by a severe lack of spiked shoes) as their other opening bat departed after being run out by a combination of Chris and Russell. Millwall’s number 3 was playing some nice shots and particularly took a fancy to the bowling of Nishan who replaced Dan coming down the hill. The 3rd wicket fell again from the other end though- Geoff with a little 3 over cameo proved too much for their number 4 who lofted a drive into the grateful hands of Josh at mid on. The wickets were now coming at regular intervals now as Nishan joined the party thanks to Chris taking a good catch. Kamal also nabbed a wicket with Channa taking a fairly straightforward catch (something that he sadly wasn’t able to replicate again as he walked home with the muppet moment). Josh was the next man to be thrown the ball in what was to be an action packed 2.3 over spell. The first ball created a chance that was dropped, the second and thirds balls despite being rank long hops managed to produce catches for Dan and Chris respectively. Alas, a first Whalers hat-trick didn’t happen for Josh but the Whalers now only needed 3 more wickets. That soon became 2 when Josh got another wicket- this time bowled. Kamal got his 2nd thanks to a theatrical effort from a diving Will before another mix up in the running department saw another run out and Millwall being bowled out for 148. 149 looked a chaseable score, but after being bowled out for less than that last week, the Whalers didn’t want to be losing early wickets. Dean was in no mood to hang about as anything short disappeared over midwicket. His opening partner Luke also hit some early boundaries albeit in not such a glorious fashion (predominantly/exclusively past the wicket keeper/slip), but as Josh’s bowling proved earlier it doesn’t matter how you get them, as long as you get them. Luke’s innings however came to a fairly swift end for 12 runs as he was bowled. Channa was the next man in but unfortunately he was also bowled, but not before he had hit a lovely 4 down the ground. With the Whalers 2 down and 60 on board you would still have backed the home team, especially with Dean at the other end scoring freely. Will stepped out to the middle and he also looked in good touch with an array of shots all around the ground. The rattled off the remaining 89 runs needed with relative ease and a full 15 overs to spare. In the end a relatively comfortable win but with the season about to draw to a close a win going into the final two games is a bonus. This entry was posted in Uncategorized on August 21, 2018 by whalers1. As England hurtled towards victory in the second test, the Whalers begrudgingly gathered in a grey and drizzly Wimbledon for a rematch with the Energy Exiles. Captain Jack lost the toss and the Whalers were put in to bowl. Still awaiting the arrival of their 10th player, Dan got things going with some looseners, interspersed with the occasional testing delivery. Russel joined in from the other end, with some tighter bowling, and both openers offered just enough to give the Exiles’ opening batsmen the opportunity to get the score moving. Dan continued to improve, but both he and Russell struggled to make the breakthrough in the first 8 overs. Amit came on for the first change and immediately found his line and length, which Jack quickly copied from the other end. The change proved fruitful as Jack removed Wingfield for 15 and his replacement for a duck, before Amit lured the Exiles’ number 3 into a lofted drive which was caught at mid-off. The Whalers kept things tight – Amit took two more quick wickets (but failing to get a wicket with the hat-trick ball) – and went into drinks feeling like they had the slight advantage. Another bowling change brought the Whalers’ leading wicket taker of the season into play, and Josh was joined at the other end by Matt. A few looser deliveries were seized upon by the Exiles’ number 5, interspersed with some mighty swings at fresh air, and he and Ahmed began to find the boundary. They were helped by no less than five dropped catches by Amit and Luke, including some attempted goalkeeping by Luke. Fortunately Josh is leading the wickets for a reason, and he soon had their number 5 caught by Dan before bowling his replacement. Matt had kept things under control from the other end, and his chuntering about the dropped catches was rewarded by a caught and bowled. 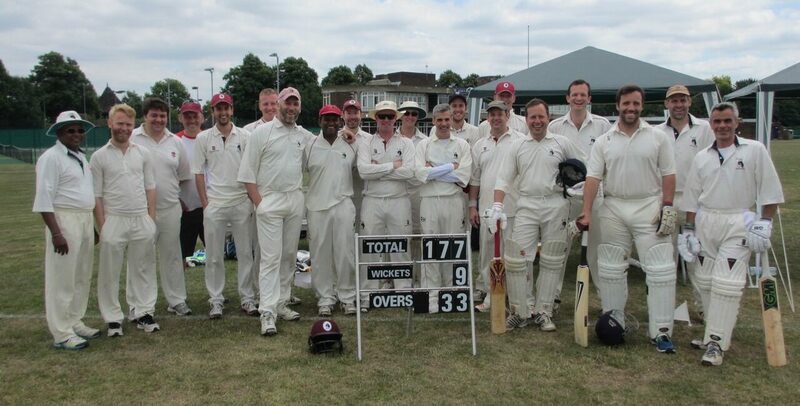 The Exiles had managed to up the run rate a bit, and when Geoff took the last wicket of Gundry (this time Luke managed to take the catch) the Exiles had finished on 140 – probably 15 or 20 runs more than should have been allowed. Dean and Luke strode out to the middle full of sandwiches and confidence, ready to begin the assault on the run chase. Some good opening bowling from Wingfield and Ahmed (who was producing a lot of swing) kept the Whalers run rate in check for the first few overs. Dean managed to find the boundary a couple of times and, having taken a liking to Ling at the change of bowlers with a hefty six over cow corner, then gave his wicket away with a soft caught and bowled to leave for an uncharacteristically low 39. Luke was following him to the pavilion the next over, missing a straight one from Gundry. Geoff, unsurprisingly, looked to attack from the beginning as he and Matt looked to rebuild. Ling struck again to remove Matt, and Geoff followed not long afterwards as the Whalers looked to push the run rate up. Russell announced his arrival with a couple of boundaries down the ground before copying Luke in missing a straight full toss. Dan and Josh tried to improve with some sharp running, but Dan was caught on the leg side for 8. Amit arrived and tried to keep things going, but by this point the run rate was looking ominous and the Whalers were running out of batsmen. When Amit was caught, it was left to Jack and Josh to try and get the Whale over the finish line. Despite picking the inswinging slower ball, Josh somehow managed to miss it and was bowled, leaving the Whalers all out for 122, and still awaiting the arrival of their 10th player. Champagne moment went to Jack for his awayswinging yorker to bowl their number 4 for a duck. Amit and Luke shared the Muppet moment for their countless drops (though honorable mentions are made for those batsmen bowled by a full toss), and Jack picked up man of the match for his 2 wickets for 5 runs off 4 overs (though big questions were asked as to why he didn’t bowl himself more). This entry was posted in Uncategorized on August 15, 2018 by whalers1.